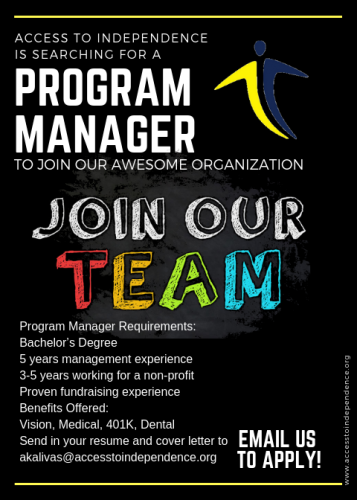 Access to Independence of San Diego Inc., a non-profit Center for Independent Living serving people with disabilities, is seeking a Program Manager in our San Diego County branches. In order to succeed in this role, candidates must have proven experience in the following: build relationships, communicate effectively and lead a team by focusing on consumer needs and fostering teamwork. An ability to think creatively, make effective decisions, organize, plan and solve problems is a must. Lived experience with a disability is a plus. Send your resume and cover letter to akalivas@accesstoindependence.org.